This morning on my weekly visit to the Marin county Farmer’s Market at the Civic Center, I thought -we are so fortunate in Marin County to have one of the best markets in the world right here in our backyard. 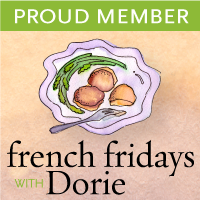 Which brings me to this week’s assignment for French Fridays with Dorie, the online cooking group cooking it’s way through Around My French Table by Dorie Greenspan. The assigned non-recipe recipe for this Friday was to find ingredients to put together your own strawberry & goat cheese inspired tartine, just like Dorie -who created a market day tartine from her local boulevard Raspail market in Paris. Finding perfectly ripe sweet strawberries this time of year was no problem, with plenty of stands selling beautiful strawberries. I also picked up a baguette from my favorite bakery, Della Fattoria and this morning I was good -leaving that beautiful rustic fruit tart behind, still feeling a bit sad about that, however. I’m going to date myself now but I remember buying Laura Chenel’s Chèvre at the San Rafael market years ago and still miss her soft ripe goat cheese at the market these days. But, not to worry I picked up a piece of Broncha a blend of goat and cow milk cheese from Achadinha Farmstead Cheese Company of Petaluma. I asked my strawberry vendor if he wanted me to mention him in my post but he said no, he already has too many people bugging him. So, I included a few pictures of his strawberries in a collage below, including the fraises de Californie boxes for all my french loving friends and a sweet little girl helping with the sample fruit. Adapted from Around My French Table by Dorie Greenspan. Layer the strawberry slices on the bread, sprinkle with goat cheese and drizzle on the honey to taste. The baguette can be toasted and if you use soft goat cheese it can should be spread on the baguette before layering on the strawberries. SO loving these summer tartines! Simply perfect. I need to get to the farmers market this weekend and snap up some of the great summer goodies. I NEED to get some of the Farmstead cheese you mentioned – it sounds divine. Great photos Patty! The cheese you chose looks delicious–and what a sweet little helper, too! Happy weekend, Patty! It’s now strawberry pickin’ time here, too! Beautiful strawberries and you are very lucky to live in such a fertile place. I would love to share a slice of your strawberry goat cheese tartine with you. Cheers have a great weekend! I could easily make a meal out of your tartines; love the strawberries! OH my, those strawberries look heavenly. You do realize that I have a strong case of farmer’s market envy right now? Your photos are such a delight Patty! A brillant celebration of the season! While you bask in Marin County sunshine I am huddled under the blanket of “June Gloom”! Beautiful Patty. Oddly the local strawberries were only mediocre but we had a bundle of very delicious cherries so I mixed it up and LOVED the results. So much so, I just had this for breakfast just now. lol. These tartines look so bright, summery and delectable. My mouth is literally watering just from looking at the photos! What a splendid way to use fresh strawberries and goat (cow) cheese! Spotted your photo on Pinterest last night and really love the colour + composition. Thanks for sharing with us your favourite vendors at the market! Your pictures are gorgeous and I am so jealous of the amazing fresh ingredients you already have available. It is still cold and raining here in NY. That June gloom has hit us here in Jersey, too! I’m looking forward to picking fresh strawberries next week…weather permitting. Your Tartines look luscious with your beautiful ripe berries! Have a great weekend, Patty! Just gorgeous, Patty! I’m looking forward to trying this again with local berries, next week. Actually, I think I’m going to be ‘trying’ different versions of this all summer long. Now this is my kind of tartine. Positively elegant and I’m with Laura. I’d enjoy this beyond the appetizer course! I loved this recipe! I had some really nice strawberries from a farmer who, in addition to being local and organic, also delivers. I can’t wait to make this again for breakfast tomorrow! Your tartines look so lovely! And that cheese on top just looks and sounds scrumptious! Spectacular photos, Patty! I want to move to Marin county and be your neighbor!!! With strawberries that look so tasty, no wonder your strawberry vendor doesn’t need the press. Looks delicious. Summer means berry time!!! I love berries in all manners – be it in a sweet dessert or a savoury starter / salad. Strawberry and goat cheese is already a wonderful combination – with the addition of truffle honey, it takes the crostini into a whole other level! Can’t wait to try this! Thanks for sharing all those photos- what fun and that little girl is adorable. Had to chuckle that the vendor didn’t want to be included but my his goods look amazing. I didn’t go the farmer’s market route as ours are hit and miss here in the suburbs but yours looks amazing. I will say that Nana and I visited the Raspail market on several occasions when we visited Paris before- we tend to stay just a few couple blocks over. 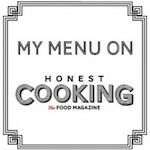 Love that area….. And yes, your actual recipe looks amazing. Now I want to get some truffle honey too !! Having a great farmer´s market close by is a treasure! Love this tartine, and your vendor´s comment, jaja! I absolutely love this, Patty! Goat cheese and strawberries is a great combination, and in these tartines I bet the flavors just sing together! Thanks for sharing. What an amazign appetizer! Goat cheese and strawberries would be so good together! Pinned! I do love artisan cheese and the farmers market. And the honey on top looks beautiful. I feel like I’ll be making this a lot this summer. There are so many combinations to try with different breads, berries, and cheeses. The photo of the little girl helping with the berries is priceless! I’ve never heard of “truffle honey”. The name sounds amazing. I didn’t know goat cheese and strawberries can be a great combination. So fun to discover new flavor. These tartines look so good! The markets sound amazing, I love discovering new foods. wow. the photos are gorgeous! and truffle honey sounds fantastic! great job!